Penneech - thanoscardgamess jimdo page! This two-hander is known only from descriptions written in 1688. It is a point-trick game with a point system reminiscent of its contemporary All Fours (the ancestor of Pitch, Cinch and Don), and it is the only game that keeps changing the trump suit from trick to trick. David Parlett reconstructed its rules and he considers that both Penneech and All Fours are of Dutch origin and have entered England in the train of Charles II upon his return from the Low Countries in 1660. 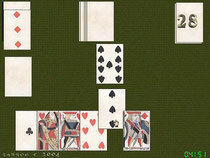 The etymology of Penneech, which primarily denotes the 7 of Diamonds, is unknown. Here, you may play it using historic card decks.